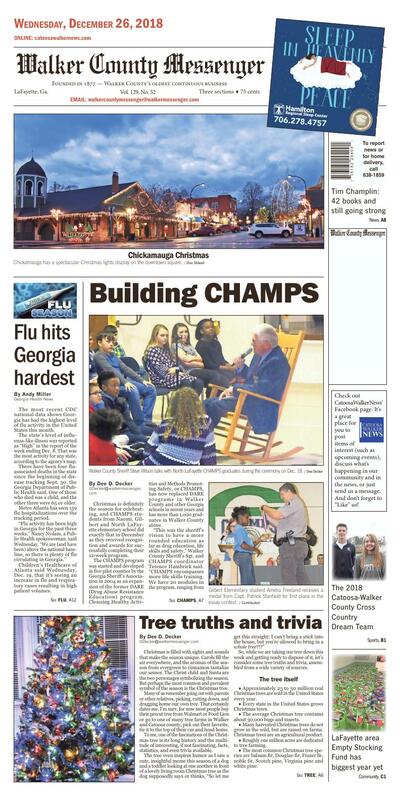 Chickamauga has a spectacular Christmas lights display on the downtown square. The most recent CDC national data shows Georgia has had the highest level of flu activity in the United States this month. The state's level of influenza-like illness was reported as "High'' in the report of the week ending Dec. 8. That was the most activity for any state, according to the agency's map. There have been four flu-associated deaths in the state since the beginning of disease tracking Sept. 30, the Georgia Department of Public Health said. One of those who died was a child, and the other three were 65 or older. Metro Atlanta has seen 159 flu hospitalizations over the tracking period. Children's Healthcare of Atlanta said Wednesday, Dec. 19, that it's seeing an increase in flu and respiratory cases resulting in high patient volumes. The Georgia chapter of the American Academy of Pediatrics said that pediatricians in the Savannah and metro Atlanta areas have seen many children with flu. The data on disease prevalence come after an especially brutal flu season a year ago. Last winter's flu season was the deadliest in at least four decades, the CDC said, with an estimated 80,000 deaths in the nation. In Georgia, there were 155 confirmed influenza-associated deaths reported last flu season, the state Department of Public Health said. That figure may be lower than the actual number because not everyone who dies has been tested for flu, the state agency said. And Public Health added that it may not have been notified of all deaths. Of the reported Georgia deaths, 109 were among people 65 or older. The CDC recommends a yearly flu shot for everyone 6 months old or older. • Stay home from work or school if you're sick, so you don't spread the flu. Before returning to school or work, flu sufferers should be free of fever (without the use of a fever reducer) for at least 24 hours. • If your doctor prescribes antivirals, take them. • If you're not sick, stay away from people who are. • Wash your hands thoroughly and frequently to help guard against the flu. If soap and water are not accessible, the next best thing is to use alcohol-based sanitizing gels. • Cover the nose and mouth when coughing and sneezing to help prevent the spread of the flu. Use a tissue, or cough or sneeze into the crook of the elbow or arm. • Avoid touching your face, as flu germs can get into the body through mucus membranes of the nose, mouth and eyes. Walker County Sheriff Steve Wilson talks with North LaFayette CHAMPS graduates during the ceremony on Dec. 18. Gilbert Elementary student Amelia Freeland receives a medal from Capt. Patrick Stanfield for first place in the essay contest. The CHAMPS students ended the Naomi ceremony by doing a CHAMPS chant for their family members. Naomi CHAMPS Student of the Year is Aedan Minton. CHAMPS Student of the Year at Gilbert Elementary is Carleigh Suttle. North LaFayette CHAMPS essay winners (from left) Khymora Hagood, Ava Gibson, and George Sholtz have their picture taken with CHAMPS director Sgt. Terrance Hambrick (far left) and Walker County Sheriff Steve Wilson. First-place essay winners at Naomi Elementary are Aiden Ledford, Sophia Gilreath and Robert Bright. Christmas is definitely the season for celebrating, and CHAMPS students from Naomi, Gilbert and North LaFayette elementary school did exactly that in December as they received recognition and awards for successfully completing their 12-week program. The CHAMPS program was started and developed in five pilot counties by the Georgia Sheriff's Association in 2004 as an expansion of the former DARE (Drug Abuse Resistance Education) program. Choosing Healthy Activities and Methods Promoting Safety, or CHAMPS, has now replaced DARE programs in Walker County and other Georgia schools in recent years and has more than 1,000 graduates in Walker County alone. how to deal with bullying and peer pressure to things like gangs, and even Internet, boating and hunting safety." Some of the course programs include alcohol awareness, drug awareness, choices and consequences, positive alternatives, vehicle safety, and seat belt usage. Program topics, subject matter and activities include Internet safety, bullying (gangs, violence, peer pressure, choices, and consequences); alcohol; drugs (marijuana, methamphetamine, cocaine, and prescription drug abuse); outdoor activities (ATV safety, fishing, hunting and firearm safety); and a CHAMPS project (an essay/poster contest). The program's mission statement is "to provide an educational program for Georgia's youth, which provides guidance, and the skills, ability, and knowledge to be safe, healthy, and happy, in preparation for a successful life." Hambrick said that mission is really a long-term goal and mission. "Working with the school system, we'll be monitoring these fifth-graders through the eight years until their graduation from high school." Walker County Sheriff Steve Wilson reinforced that mission emphasis, telling the CHAMPS graduates to buy a frame, to frame and hang their CHAMPS graduation certificate on their bedroom wall, and to look at it daily until they replaced it with their high school diploma in eight years. The mission is long, yes, and sometimes rocky, but Hambrick, a nearly 30-year veteran of law enforcement and an ordained minister, says the mission is worth the commitment and effort. "My reward is seeing the children doing well and years later as productive citizens." The dynamic officer easily builds rapport with students, earns their respect, and sparks enthusiasm in the CHAMPS program and in building a strong, productive future. His impact is as much or more through his example as through his message, for his students know that he is genuine, and that he genuinely cares about them, their families, and their future. Truly, Officer Hambrick IS a CHAMP leading his CHAMPS. Christmas is filled with sights and sounds that make the season unique. Carols fill the air everywhere, and the aromas of the season from evergreen to cinnamon tantalize our senses. The Christ child and Santa are the two personages symbolizing the season. But perhaps the most common and prevalent symbol of the season is the Christmas tree. Many of us remember going out with parents or other relatives, picking, cutting down, and dragging home our own tree. That certainly dates me, I'm sure, for now most people buy their precut tree from Walmart or Food Lion or go to one of many tree farms in Walker and Catoosa county, pick out their favorite, tie it to the top of their car and head home. To me, one of the fascinations of the Christmas tree is its long history and the multitude of interesting, if not fascinating, facts, statistics, and even trivia available. The tree even inspires humor as I saw a cute, insightful meme this season of a dog and a toddler looking at one another in front of a lovely living room Christmas tree as the dog supposedly says or thinks, "So let me get this straight: I can't bring a stick into the house, but you're allowed to bring in a whole tree?!?" So, while we are taking our tree down this week and getting ready to dispose of it, let's consider some tree truths and trivia, assembled from a wide variety of sources. • Approximately 25 to 30 million real Christmas trees are sold in the United States every year. • Every state in the United States grows Christmas trees. • The average Christmas tree contains about 30,000 bugs and insects. • Many harvested Christmas trees do not grow in the wild, but are raised on farms. Christmas trees are an agricultural product. • Roughly one million acres are dedicated to tree farming. • The most common Christmas tree species are balsam fir, Douglas-fir, Fraser fir, noble fir, Scotch pine, Virginia pine and white pine. • There are almost 15,000 farms growing Christmas trees in the U.S. and more than 100,000 people employed in the industry. • There are approximately 350 million Christmas trees growing on U.S. farms. • Christmas trees can be recycled into mulch, and in the United States, there are more than 4,000 Christmas tree recycling programs. • 93% of real Christmas tree consumers recycle their tree in community recycling programs, their garden or backyard. • The use of evergreen trees to celebrate the winter season occurred before the birth of Christ. • The first decorated Christmas tree was in Riga, Latvia in 1510. • The first printed reference to Christmas trees appeared in Germany in 1531. Germans are credited with bringing the first Christmas trees into the home and decorating them in the spirit of Christmas. The first recorded reference to the Christmas tree dates back to the 16th century. • The tree was traditionally decorated with edibles such as apples, nuts, or other foods. In the 18th century, it began to be illuminated by candles which were ultimately replaced by Christmas lights after the advent of electrification. • England's first Christmas tree was brought to Windsor by Charlotte, wife of George III, in 1800... but it was the trees brought in the 1840s by Prince Albert, consort of Queen Victoria, that led to their popularity throughout the UK. • The first use of the term "Christmas tree" in English was in 1835. • In the U.S., Pennsylvania German settlers had community trees as early as 1747, but the first record of a tree being on display in America was in the 1830s. • Queen Victoria popularized the Christmas tree. In 1846, Queen Victoria and her beloved Albert, a German prince, were sketched standing with their children around a Christmas tree, making it immediately popular with both the British court and East Coast American society. • Live Christmas trees have been sold commercially in the United States since about 1850. • The first Christmas tree retail lot in the United States was started by Mark Carr in New York, in 1851. • Artificial Christmas trees were developed in Germany during the 19th century and later became popular in the United States. These "trees" were made using goose feathers that were dyed green and attached to wire branches. The wire branches were then wrapped around a central dowel rod that acted as the trunk. • President Benjamin Harrison placed the first Christmas tree in the White House in 1889. Not all White House families put up trees after President Harrison. Teddy Roosevelt, a devoted conservationist, didn't approve of cutting trees for Christmas decorations. • Manufactured Christmas tree ornaments were first sold by Woolworths in 1880. • Thomas Edison's assistant, Edward Johnson, came up with the idea of electric lights for Christmas trees in 1882, and Christmas tree lights were first mass-produced in 1890. • Grover Cleveland's presidency saw the first electric lights used on a White House Christmas tree. • Calvin Coolidge was the first president to preside over the National Christmas tree lighting ceremony in 1923. The United States' National Christmas Tree has been lit each year since 1923 on the South Lawn of the White House. • The Rockefeller Christmas tree tradition dates back to the Great Depression. In 1931, construction workers at the Rockefeller Center site decided to pool their money to buy a tree that they decorated with handmade garlands. In 1933, Rockefeller Center made it an annual tradition. During WWII, the Rockefeller tree was decorated with patriotic red, white, and blue globes and stars—and no materials needed for the war could be used on the tree. In 1944, the tree couldn't be lit due to wartime blackout rules. Since 2004 the tree has been topped with a 550-pound Swarovski Crystal star. And since 2007, the tree has been lit with 30,000 energy-efficient LED's which are powered by solar panels. • Jackie Kennedy began the tradition of selecting a theme for the official White House Christmas tree in the Blue Room in 1961, with a Nutcracker Suite ballet theme. • During most of the 1970s and 1980s, the largest decorated Christmas tree in the world was put up every year on the property of the National Enquirer in Lantana, Florida. This tradition grew into one of the most spectacular and celebrated events in the history of southern Florida, but was discontinued on the death of the paper's founder in the late 1980s.